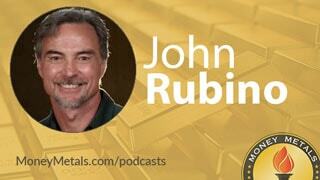 Coming up we’ll hear from John Rubino of DollarCollapse.com, who shares his insights on the likelihood that negative interest rates are coming to us here in the U.S. and other factors that could be very bearish for economic growth, but an environment that could be very bullish for gold. Don’t miss my interview with John Rubino, coming up after this week’s market update. The HUGE news today is Brexit. European equity markets had been surging while precious metals markets slumped BEFORE the votes were counted in UK’s national referendum last night. Financial market players had become totally convinced that the British people wouldn’t DARE vote to leave the troubled EU. And how wrong that was! And with the news of a truly historic vote by Britain to reclaim some of its independence, market volatility increased dramatically -- with all stock markets and most currencies falling sharply – while gold and silver shot up. Gold rebounded from a $50 loss on the week through Thursday, to a $50 GAIN last night – a $100 swing! Gold is currently trading at $1,316 an ounce as of this Friday morning recording, off from levels seen last night after the leave vote was secured, which had the yellow metal at about $1,350, a 2-year high. Same story with silver, currently trading at $17.80 per ounce. Both of these precious metals are performing beautifully – really as they should when currency and stock markets are in turmoil. Gold and silver have already been the best asset class all year, and these events have the potential to push the flight out of paper assets into hyper-drive. While the big news has been coming out of Europe, Federal Reserve chair Janet Yellen testified before Congress in recent days. She delivered her usual scripted reassurances on the economy and Fed policy. However, in an unscripted moment, she admitted that low interest rates have the potential to blow up unstable asset bubbles. Fox Business Anchor: Are we heading for bubble trouble? Well, many of you may have suspected this, but now Fed Chair Janet Yellen admitted in her testimony to Congress under the Q&A watchful eye, that it could possibly be something that happens. Listen. Janet Yellen: Low rates can, umm, induce households or banks or firms to reach for yield, and can stoke financial instability. History shows that whenever the Federal Reserve embarks on a period of protracted rate cutting and stimulus, markets get distorted. Cheap money flows into an asset class, and valuations go out of whack. It’s happened repeatedly with the stock market and housing market. By now the hazards of artificially low interest rates should by obvious to everyone. It’s not a question of whether a bubble will form, but where it forms and when it bursts. No one complains, though, while the bubble is forming. When it bursts, blame is diverted to greedy speculators or lack of government regulation, even as major financial institutions that were complicit in fueling the excesses get a pass or a bailout. In the world of financial markets, people have very short memories. They quickly forget the lessons they should have learned during the last financial crisis and go on to make the same mistakes all over again. In some ways, it’s hard to blame people for piling into expensive stocks and flipping houses in overpriced markets again. The Fed’s low interest rate policies provide an incentive to speculate, to chase for higher yields in riskier assets, and to borrow beyond their means. This year the auto loan market surpassed $1 trillion for the first time. Student loan debt now comes in at more than $1.3 trillion after tripling over the past decade. Heavily indebted students aren’t getting better educations. They are instead enabling Universities to become sprawling, self-serving bureaucracies with offices, departments, and programs for every politically correct identity group that exists or that has been invented recently by some tenured radical. Wherever debt gets excessive, so does goofiness. Lax mortgage lending practices are making a comeback as more borrowers stretch themselves financially to be able to buy a home. One major national lender is currently running a TV commercial touting smartphone-based “rocket mortgages.” What could possibly go wrong? Rocket Mortgage Television Commercial: Here's what we were thinking. What if you could get a mortgage on your phone? Wouldn't more people buy homes? Wouldn't those people need to fill their homes with household goods, and wouldn't the makers of those goods have phones from which they could easily secure mortgages of their own? Further [stoking 00:00:16] demand as our tidal wave of ownership floods the country with new homeowners, who now must own other things. Anyway, that's what we were thinking. It sounds like something from 2007. Back when Federal Reserve officials, Wall Street cheerleaders, and Bush administration mouthpieces all assured us that rising housing prices create this virtuous wealth effect throughout the economy. Fast forward to 2016, and this exact same sort of fairy tale is being told to us again. And the exact same sort of policies are being pursued at the Fed. The Fed chair believes it is her job to help engineer rising price levels. It seems that everyone at the Fed, and in government, and on Wall Street, and in the banking establishment wants to us to equate rising asset prices with rising prosperity. But it’s just not true. Prosperity comes through rising purchasing power. When housing prices fall, houses become more affordable to more wage earners and savers… more broadly, when your earnings and savings enable you to buy more stuff, you become wealthier. But our policymakers have decided that attacking the purchasing power of dollar-denominated wages and savings is the only viable path forward. The way you can protect yourself is by owning real assets that are undervalued compared to bubbly assets such as stocks, bonds, and “hot” real estate markets. Precious metals fit the bill better than most any of the major alternatives at this point in time. At some point, gold and silver could enter bubble territory like they did back in 1980. But we are nowhere near a bubble in metals now. We are only a few months into a recovery that could be just the beginning of a multi-year bull market. Mike Gleason: It is my privilege now to be joined by John Rubino of DollarCollapse.com. John is a former Wall Street analyst, a writer for CFA magazine, and a featured columnist with TheStreet.com. He's also authored several books, including "The Collapse of the Dollar and How to Profit From It" and his latest book, "The Money Bubble." John, it's great to have you back with us. How are you? John Rubino: Hey, Mike. I'm all right, how are you? Mike Gleason: Excellent. Well since we’re talking here on Thursday before the Brexit decision is known we’ll concentrate on some other things and have the conversation about the fallout of Brexit another time. Now here in the States we’ve had Janet Yellen talking about negative interest rates, and when asked earlier this week she said that the U.S. Fed does have the legal basis to implement negative interest rates should they decide to go that route, although she assures that that isn't planned at this point. Now I find it a little coincidental here John, that one, she'd have the answer to that question ready to go and had done the research about how she believes it's legal – like she wanted to plant the seed there – and then two, the fact that many other major central banks around the world are going to negative interest rates, if it weren't the intention of Yellen and the Fed to eventually do the same. So comment on that idea and the likelihood of negative interest rates here in the U.S.
John Rubino: Well, it's surprising that we don't have negative interest rates in a way because the U.S. is still seen as the safe haven economy. The U.S. dollar is seen as the safest asset in the financial world, so our interest rates ought to be commensurately lower. We should have the risk-free rate, and yet Germany's bond market is negative all the way out to 10 years. So is Switzerland's. Japan's is almost negative out to 10 years. That means their interest rates are lower than ours, which implies that the market thinks they're less risky than U.S. treasuries. That's kind of counter-intuitive because U.S. treasuries are generally considered to be the least risky financial asset, so why are our interest rates higher than theirs? It's not clear yet. Part of it is that their central banks are buying up basically all the government debt that it exists out there. It creates a shortage, which makes prices go up, which in other words makes yields go down. And part of it is just that we haven't gotten to it yet. It's just one of those anomalies that will be worked out when people arbitrage away the imbalances. And that will happen very probably by money flowing out of places like China and Japan and Europe – because those systems are so clearly closer to the breaking point than we are – and flowing into U.S. assets. So we could have a year or two of capital inflows that push down our interest rates here, and we could get zero to negative interest rates in that way. All the Chinese money flowing out of China, buying treasuries pushes down the yields on treasuries, and so we could get there. But the important thing to understand is that that's a really bad thing. To have negative interest rates screws up the pricing, the price signaling mechanism of the financial markets, and it leads to mal-investment of capital, because if people with capital who are trying to decide whether to build a factory here, or a house here, or whatever, or road or bridge, if they can't tell whether that's a good idea because the price of money is being artificially distorted, then they're going to make mistakes. They're going to build things that shouldn't have been built, can't generate the cash flow necessary to pay off the related debts, and therefore either just lower the wealth in the system or cause a crisis when the people who borrowed money in order to build these things default. You're seeing that in China now already where they borrowed probably more money than any country has ever borrowed in a six-year span and wasted a lot of it, so they're having a financial crisis that they're trying to deal with in various ways, but it's got Chinese rich people totally spooked, and they're sending their money out of the country as quickly as possible. Japan, same thing. They did there's earlier. They had their mal-investment binge in the 1990's and have never really recovered from it. And Europe is a mess also, and the U.S. is headed that way because the price signaling mechanism of all markets has been basically crippled by these incredibly low and sometimes negative interest rates. So we're beginning at the point of huge financial imbalances that have to be worked off through some kind of a crisis, and we're making it worse by pushing interest rates down and leading people to do ever dumber stuff with their money. So there's no end in sight to this, and the idea that we might end up with negative interest rates is both completely possible and catastrophic when and if it happens. Mike Gleason: Yeah, certainly that's the big crux for all of the asset bubbles that the monetary system that we have in place and the Federal Reserve system has created over these last few years. Very well put there. It's a lot of mal-investment that's going out there, and making bad decisions, and propping up assets that eventually will collapse because it's not supportable. Now the big knock on gold has always been that it has no yield. Of course it's always been an unfair knock in our view because gold is money, a kind that actually has been enjoying significant capital appreciation, at least in dollar terms. But it is true to say that the average person can't get paid interest when they hold gold, but if we see negative interest rates in all these world currencies, then all of a sudden that game changes and changes tremendously for the elemental. Gold paying no interest actually has a higher yield than other alternatives. Talk about that dynamic. John Rubino: Yeah, a negative interest world is, at least in theory, phenomenally good for gold because, as you said, we normally compare cash flows with assets, and if money in the bank is going to yield you 4% or 5% like it has historically prior to the vary recent advent of super low interest rates, then gold has a disadvantage because it actually costs you 1% or so a year to store. So you're at, let's say, a 6% and you owe cash-flow disadvantage in that world. In this world, where money in the bank costs you rather than pays you and currencies are actively being devalued around the world, then gold, which can't be devalued by governments and only charges you 1% for storage looks suddenly good from a cash-flow standpoint. Suddenly gold is a high yield asset compared to some forms of cash. So who in their right mind would own fiat currency and accept an annual loss on it when you can own gold, which is a far more stable kind of money and hold your own year after year. Your purchasing power remains the same when you own gold over long periods of time, and your purchasing power goes down when you own fiat currencies over long periods of time. So you would think that in that kind of a world a lot more money would be flowing into gold, and you know what, that's happening now. The physical demand for gold is through the roof lately, and that comes from central banks in Asia who are continuing to increase their gold reserves and individuals mostly in Asia who are big buyers of gold jewelry and gold bullion. And now it's starting to come from people in the West, individuals mostly, who are buying gold and silver coins at the fastest rate ever. Most of the big mints out there are operating flat out. They're selling record amounts of especially one-ounce silver coins, and there's no end in sight to that. And what that means is that individuals are starting to come to the conclusion that we're talking about here, that they'd rather have a sound form of money like precious metals than the cash that they currently have. They're taking that cash and they're buying silver coins, and that puts not necessarily a floor under the price but it helps support the prices of gold and silver. When the prices begin to move up, as they have lately, it adds extra momentum to that upward price move because there's a lot of people out there now who are dithering, right? They're thinking, "Do I have enough silver and gold? Should I buy some more here?" And if the price goes up a lot of them are going to panic and think, "Well, if I'm ever going to get it I got to pay today's price," and so they jump in and they buy, and that gives whatever kind of move that's happening some extra momentum. So we should expect that to continue as long as the world's governments and central banks are screwing up their own monetary policy and fiscal policy. And since there's no end in sight to government deficit spending, and central bank over-creation of currency, and interest rates falling, there's not end in sight to any of this, you would think that the current gold bull market that is now in progress is going to have some legs and it's going to grow into possibly major long-term run to the upside. Mike Gleason: Some of those individuals who are putting their money into gold have been some of these well-known billionaires. We’ve got Soros, Druckenmiller, Carl Icahn and so forth bailing out of equities, and they have all turned quite bearish on the mainstream financial markets. And it seems like a lot of these guys are putting their money where their mouth is when it comes to swapping a lot of that into gold. What should be the takeaway there, John? Because these guys genuinely have a pretty good track record when it comes to making money. John Rubino: They do, especially at big turning points. And between the three guys you just named, there's about a century of experience, and they've seen every kind of market and every kind of financial screw up that's possible in the part of governments and central banks. And they're interpreting what they're seeing now as a signal to get out of equities, to be weary of bonds, and to load up on precious metals, which is basically the gold bug thesis writ large in billions of dollars instead of hundreds and thousands. There's no guarantee that they're right, but based on their own history there's a pretty good chance that they're right, and in any event it's comforting to have these guys on the same side as you as you stack your silver coins. So I think that because there's a good chance that they're right, that's one more data point in the thesis that we've turned the corner on precious metals and that for the next few years the average trend should be higher. Mike Gleason: I wanted to get your take on the presidential election here, the major presidential candidates and what impacts we could see to the gold and silver market. Do you think that either a Trump or a Hilary presidency will be good for gold investors, or does the election outcome even matter? John Rubino: Well I think we're at the point where it almost doesn't matter who's in charge because there's institutional momentum now that is built up where any president in the U.S. is going to have to run big deficits, and any central bank chairperson that is nominated and put in place by whoever is president is going to have to run a really loose monetary policy. We can't not do those things if we want to avoid an immediate 1930s-style depression. Clinton would be an extension of the current policies, which, as we just talked about, are terrible and bad for most traditional financial assets and really good for gold. And Trump would be uncertain. You just don't know what that guy is going to do. Uncertainty is also bad for traditional financial assets and good for things like precious metals, which is where you hang out in times of uncertainty. So I think whoever we elect, the investment thesis it flows from that, stays the same. It's still going to be a good time to short equities, to avoid long-term government bonds, and to load up on precious metals. Now, of course there's real outlier possibilities with both Clinton and Trump because in some senses they're unpredictable, Trump more so than Clinton, but Clinton is kind of a hawk. She's pretty aggressive in terms of her foreign policy, so we could be seeing more American intervention around the world under a Clinton administration, which increases the amount of uncertainty that's out there. And Trump, again, you just don't know. He could do things that are really scary and erratic. And that would also be good for gold and silver. I think that however you slice it we're heading for some kind of a crises just because we've already baked that into the cake. We've already borrowed way too much money, and now we have really no chance of a pain-free exit from the spot we've painted ourselves into. Political campaigns in the U.S. now are more entertainment than anything else because it almost doesn't matter who's in charge. Now around the world that's not always the case because you've got some big systems that are in the process of dissolution, especially in Europe where you've got a lot of political parties who would change the system in a radical way. They're revolutionary movements rather than status quo movements, and they're all gaining momentum. So I think in the next couple years we’re going to see some elections where the status goes down in flames and loses big to somebody who nobody thought five years before would have a chance at running this country, but there they are in charge. And their platform is going to be the end of austerity and an increase in government deficit spending, a devaluation of the euro, and maybe a pull-out of the Eurozone, or a radical, radical re-writing of the terms of the European Union and of the Eurozone. So I think from the point of view of meaningful elections it's outside the U.S. where we're going to see the biggest possibility of an absolute revolution, and Europe is the place where it will start. Mike Gleason: As we begin to close here, John, it's been an eventful month of June with the Fed leaving rates unchanged last week, and then the big Brexit vote this week. What's next on the horizon? What should investors be watching for? What is the short term look like for gold and silver in your view? John Rubino: Short term, who knows, but the Commitment of Traders report thing is really interesting now because it's at record levels basically negative for the price of gold and silver. In other words, the speculators are record long and the commercials who tend to be right at turning points are record short in the U.S. futures markets. And traditionally that has been a really good indicator of what's going to happen next in precious metals, so just looking at that you would say, "Time for a big correction in gold and silver," but for the first time we've got some other forces at work out there that are kind of pointing in the opposite direction. The Shanghai Gold Exchange opened and is a physical precious metals market. So what happens there, at least in theory, we'll see if it plays out this way, if the paper traders in the U.S. force down the price of gold, then that creates an arbitrage where if the physical price is higher in Shanghai, then what you do here is you take delivery on your futures contracts and you force the COMEX to give you gold bullion. And then you take that gold bullion and you sell it in China for a higher price. And that would totally blow up the paper markets here because there isn't enough bullion stored at the COMEX Exchange to cover a lot of demands for physical metal. So we would possibly see a situation where physical demand basically short-circuits the paper games that are being played in the precious metals market, and you get a melt-up, and that would be really interesting. We'll see if that happens this time. It could be that the paper players win another time. They've definitely set up the conditions for a really big drop in gold and silver, or it could be that they get steamrolled by physical demand. Somewhere out there that event is waiting to happen: Physical will eventually set the price for precious metals, and if it's not this time it will be another time, but right not that's what's interesting to watch in short-term precious metals movements. Long term, it's up. It's going to go up from here just because we've created such a mess in the paper financial markets, and fiat currencies are going to go down just because the only solution for a lot of the governments that have screwed up their finances is to devalue their currency. Jim Rickards has what seems like the least painful scenario for this to be fixed in which the major governments of the world get together and decide to devalue, but all of them at once against gold, so we go to some kind of a modified gold standard with the gold price at 10,000 an ounce, which means the dollar, and the euro, and the yen, and the yuan become much, much less valuable overnight. So we just do it in one stroke and then we go back to a sound money system. And that's terrible if you've got a lot of your savings in fiat currency because your currency becomes one-fifth as valuable as it was when you put it in the bank. But it's great if you own precious metals and other real assets because the dollar value of those real assets goes up commensurately. That's out there somewhere too. Basically in the short run we don't know what's going to happen, but in the long run all roads lead to higher gold and silver prices and much, much cheaper fiat currencies. Mike Gleason: Very well put. There are a lot of black swans circling overhead here. It's just a matter of when the next one lands. I think there's going to be some very interesting times head here later this year, certainly with the election and into next year. It's going to be very interesting to see all this play out. Outstanding stuff, John. Thanks very much for your time, and I certainly look forward to catching up with you again soon as this all unfolds. I know that you're a very busy guy and we appreciate you taking out time in your day to give us your great insights. As always, thank you for joining us and hope you have a great weekend. John Rubino: Thanks, Mike. You too. Mike Gleason: Well that will do it for this week. Thanks again to John Rubino of DollarCollapse.com. Check out his new book The Money Bubble. John puts out some fantastic stuff both in his books and then on the website. Be sure to check those out.